This page is a Wikipedia or SolStation data dump with little or no relation – or, worse yet, with contradictions – to the situation in Fenspace. Gliese 581 (pronounced /ˈɡliːzə/) is a red dwarf star with spectral type M3V, located 20.3 light years away from Earth in the constellation Libra. Its mass is estimated to be approximately a third of that of the Sun, and it is the 87th closest known star system to the Sun. Observations suggest that the star has at least four planets: Gliese 581 b, c, d, e.
The star system gained attention after Gliese 581c, the first low-mass extrasolar planet found to be near its star's habitable zone, was discovered in April 2007. It has since been shown that under known terrestrial planet climate models, Gliese 581c is likely to have a runaway greenhouse effect, and hence is probably not habitable. However, the subsequently discovered outermost planet Gliese 581d is firmly within the habitable zone. 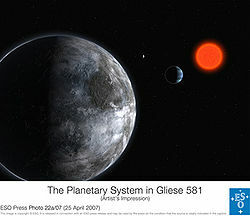 In April 2009, the discovery of exoplanet Gliese 581 e, at that time the closest-known in mass to Earth, was announced. Some Fen are planning to have a powerful radio telescope in operation in orbit around 581e for March 2029 in order to receive and record the message sent from Earth in 2008 by a "Web 2.0 Portal" corporation. Considering the contents of the message, opinions are divided as to whether this recording will be used as a historical record or as blackmail material.